Most of my weathering/shading is actually done with wet washes of various colours. 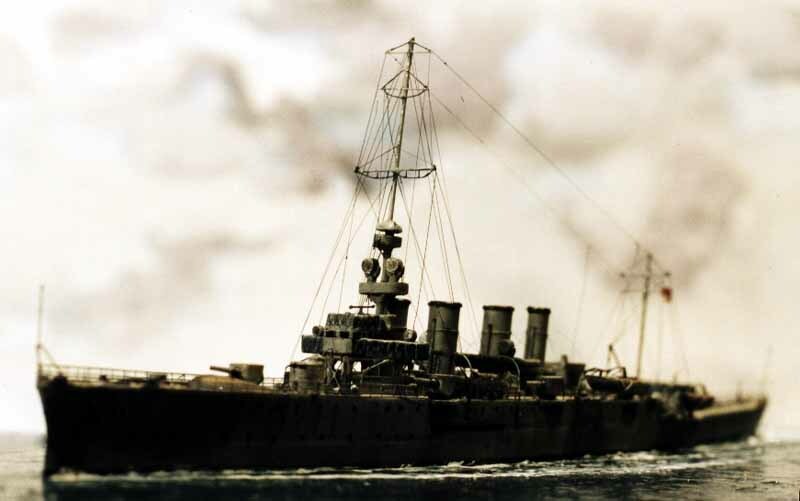 For example; If I have a light grey/white ship it is often difficult to give the ship a real 3-dimensional feel, as the various planes tend to blind/blend and as a result 3-D structures can appear very flat.To alleviate this on an angular turret for example, I brush down the appex of the angle the side of a PENCIL lead... This physically seperates the planes and provides a sense of visual depth! For darker grey ships I actually paint adjacent planes in different shades of the same colour to create depth and false shading, still using the pencil trick to differentiate planes. Streaking off portholes and scuppers is often done by sticking pencil in porthole recess,twisting slightly to create carbon deposit along the lower edge and the smudging down with finger; if the effect is too much paint with drybrush in vertical streak pattern using hull colour. In 1/700 scale I use Artists Watercolour paper which has a regular indented texture(try Winsor & Newton); firstly I cut the waterline profile out of the paper 0.5mm larger,this is done by placing the hull on paper and drawing round the hull with a sharp pencil ( before I even think about building the ship) then I stick to the base with eiter white glue or doublesided sticky tape. Build ship to the stage at which you are no longer happy to handle the ship,I ususally nount the ship in her sea before put on funnels or masts or photoetch. The ship is placed in the prepared cutout and screwed thru the base so that if it is a resin ship it prevents her warping. I then paint the sea in chosen base colour I add ships wake and bow-wave for (slow speed ) from white/PVA glue and build it up in stages. For medium speed I use Artists Acrylic gel/texture agent and shape it as it is drying. For a ship at high speed I use autobodyfiller for big wake and waves because it sets quickly (30-45 minutes!) so that I can carry on modelling! Painting Decks on Ship Models I used to (and still do) use MATT RADOME TAN by HUMBROL paints or TEAK by COLOURCOATS from WHITE ENSIGN MODELS this is brushed on ,when dry I overbrush again sparingly using the same paint mixed with mid grey, same again using deck colour mixed with light grey,always sparingly, almost dry, brushed on fore and aft only. THEN WHEN TOTALLY DRY and not a second before I make up a mix of Dark grey/black and thinners and wash the the deck down; this gives an impression of the caulking effect as it settles into cast on/moulded deck detail. If the planking detail is raised I use a pencil lead from a self-propelling pencil dragged across raised lines(ICM 1/350 Koenig for example) This mix MUST be very very thin, DO NOT overbrush it or the paint sediment will get brushed out, the thinners will soften the paint, and bingo, one wrecked deck.....Once you have washed with thinners hold model under lightbulb or heat source so that the thinner evaporates quickly, take no risks with softening paint. IF IT DOES wrinkle slightly DO NOT touch it .When DRY you should be able to press it flat and carry on the with build. I use ONLY scratchbuilt masts made of Steel/brass wire. For tall masts in 1/350 I use syringe needles, as a tube structure will not bend under tension in the sameway as a rod structure. When you make cage arials (Panay and Dreadnought etc) out of Ladies stocking lycra thread the cumulative tension is large and will pull masts out of line; even the shrinking of sprue with smoke will pull wire masts out of shape, always attach shrouds well, in model form they actually have a function even in sprue!!! For all of my rigging (see some other ships of mine posted in the Modelwarships.com gallery) I use stretched sprue; the trick is to use the RIGHT kind of sprue. I have always found great success with AIRFIX CLASSIC SHIPS (sailboats,old,large..) in particular an HMS VICTORY that I have been melting down the sprue runners on for years; when I run out I will start on the yard arms, by my retirement I may start melting the masts... The main feature of this plastic is that it is BLACK, it requires no painting, hence keeping it thin and light. If you are going to need LOTS, set up two paint tinlets on bench, and follow the procedure above but when you run out of space simply bend it around the paint tinlet and continue on till plastic cools and your thread breaks. You will need to practice a little to get consistently thin sprue. Black sprue is THE cheapest modelling material we will ever use pro rata, so if you are not satisfied with result simply discard it and start again. Having rigged some shrouds for example you may wish to tighten them. Hold model over a consistent smoke source such as inscence or cigarette (I gave up, hence joss sticks) and the hot smoke will tighteen the rigging like magic.My advice is take a very old/scrap model and practice as it is very easy to completely rig a model and then at the tightening stage get too close to heat source and completely UNRIG the model.... with resultant fury, frustration and vulgar language...! !